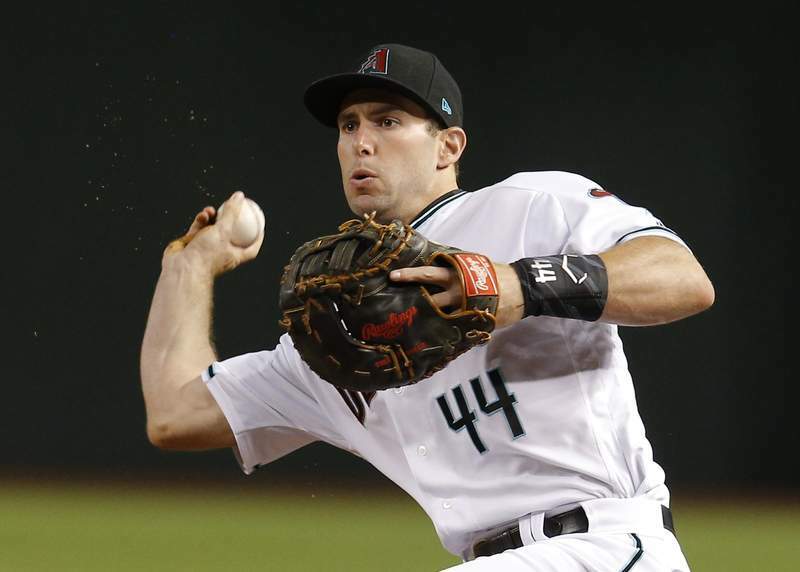 Associated Press photos All-Star first baseman Paul Goldschmidt was traded during the offseason from Arizona to St. Louis, as the Cardinals look to contend with Milwaukee and the Chicago Cubs in the NL Central. 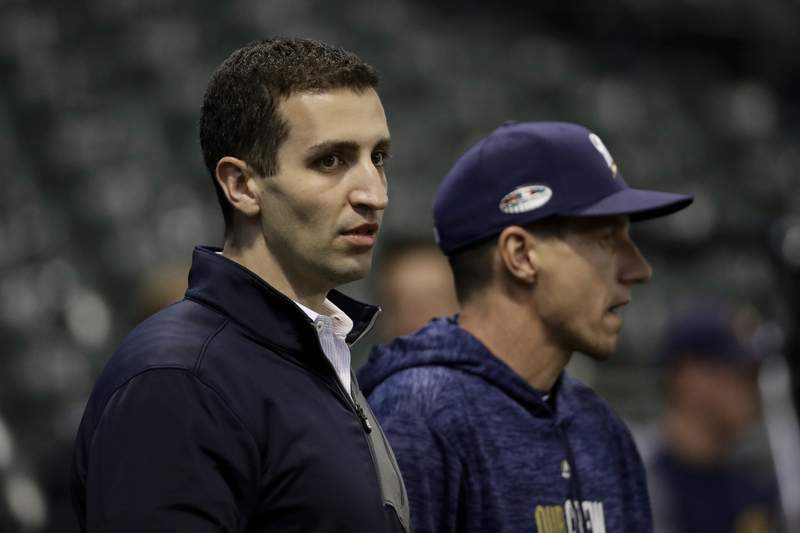 Brewers general manager David Stearns, left, and manager Craig Counsell kept their NL Central-winning team largely intact from last season. The Brewers did add catcher Yasmani Grandal. Going campin': The Brewers return mostly intact after making it to the NL Championship Series last year in the franchise's first playoff appearance since they also lost the NLCS in 2011. Grandal is a major upgrade behind the plate after he hit 24 homers last year with the Dodgers. There are questions about what the rotation will look like after Counsell relied on his powerful bullpen for much of the playoffs, but there are plenty of options. Jimmy Nelson is healthy again after missing last season following surgery on his right shoulder. Nelson went 12-6 with a 3.49 ERA in 29 starts in 2017. Right-handers Brandon Woodruff and Corbin Burnes also could step into the rotation after pitching well in the playoffs last October. The biggest questions about the lineup have to do with regression after several players put up huge numbers last season. Big first baseman Jesus Aguilar made the All-Star team for the first time on his way to a career-high 35 homers and 108 RBI. NL MVP Christian Yelich also set career highs in several categories. But Milwaukee begins spring training with one of the majors' deepest rosters, so expect a very quiet camp as the Brewers prepare for what they hope will be another long season. Going campin': It's a big year for the Cubs after they blew a five-game lead in the NL Central last September and then lost to Colorado in the NL wild-card game. Maddon is heading into the final season of his contract, and his wildly successful run with Chicago could come to an end if the Cubs are unable to bounce back. A healthy season for 2016 NL MVP Kris Bryant could help fix a lineup that has been plagued by inconsistency. Bryant, 27, was hampered by left shoulder inflammation last year and finished with career lows in games played (102), batting average (.272), home runs (13) and RBI (52). The Cubs also need Ian Happ and Kyle Schwarber to produce after they struggled at times last season. But Chicago should have a deep rotation after it picked up Cole Hamels' option in November. Right-hander Yu Darvish also returns after he missed most of his first season with the Cubs due to injuries. The bullpen is more uncertain after Chavez and Wilson departed in free agency. Pedro Strop will likely begin the season as the closer while Brandon Morrow recovers from arthroscopic surgery on his right elbow. Going campin': Pittsburgh bumped back over .500 for the first time since 2015 last year, riding a young rotation that exceeded expectations led by Jameson Taillon and a second-half surge from Trevor Williams. Still, the Pirates didn't exactly splurge on the open market in an effort to close the gap on Chicago, St. Louis or Milwaukee. Chisenhall comes over from Cleveland hoping to provide a bridge until Gregory Polanco returns from shoulder surgery. The top of the rotation is set. The only real intrigue will be for the fifth spot, where Lyles, Liriano – a fixture on Pirates teams that reached the playoffs each season from 2013-15 – and Nick Kingham will be in the mix. The back of the bullpen is set, too. Jung Ho Kang, who hit 21 home runs in 2016, returns with a chance to re-establish himself at third base or shortstop after missing 2017 and most of 2018 due to visa issues stemming from a third DUI conviction in his native South Korea in early 2017. The biggest question looming over camp will be who earns the starting job at shortstop and whether 1B Josh Bell can take steps toward regaining his power after his home run total dropped from 26 in 2017 to 12 last season. Going campin': The Reds were one of the most active teams in the offseason as they switch from four years of rebuilding and losing to trying to climb out of the NL Central cellar. The rotation has been the biggest issue in their run of four straight 90-loss seasons, and they overhauled it by trading for Wood, Gray and Roark. Bell has to decide how they line up with returning starters Anthony DeSclafani and Luis Castillo. The core of the bullpen returns intact. The trade with the Dodgers for Puig and Kemp – both of whom are free agents after the 2019 season – will shake up the outfield. The speedy Hamilton is gone after years of struggling to develop into a better hitter, and Bell will have to determine how to fill that spot with what's at hand. Scott Schebler or Puig could play center field, or Bell could try someone else at the position. Bell's first challenge in spring training is figuring out how all the new pieces fit together in time to get off to a fast start that would generate fan interest. The Reds' home attendance last season fell to 1,629,356, their lowest mark since 1984 when they were at Riverfront Stadium.